As part of Motivational March, I have another guest blogger for you, the wonderful Jenny from Sunny Sweet Pea. She has knocked up a delightfully healthy smoothie for us to enjoy on this fine Tuesday afternoon. Hi. I'm Jenny from Sunny Sweet Pea. 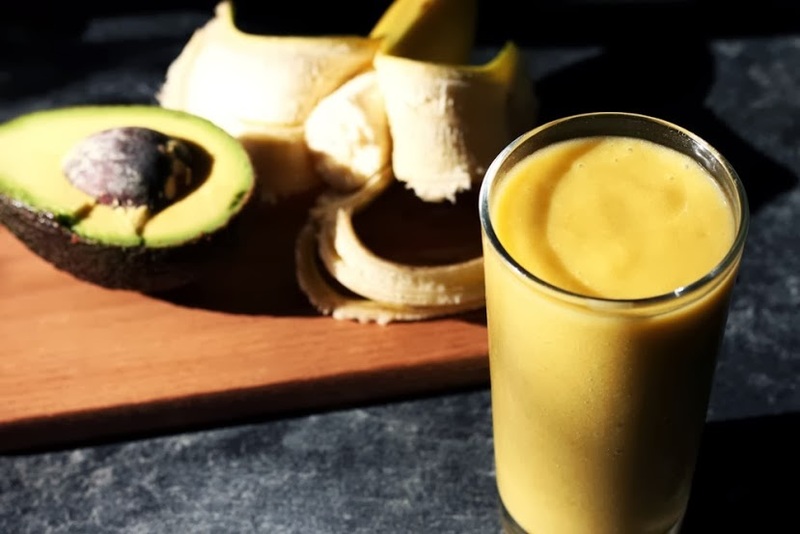 If, like me, you've decided to give up sweet things for lent, then I hope this smoothie I've created for Charlotte will brighten your day and keep thoughts of sweet treats at bay. This smoothie is dairy free. I always use tinned peaches in my smoothies. You're best putting them in the freezer as this ensures they whizz up perfectly smoothly without any bits. Put everything in your blender at once and whizz up until smooth. If you feel you need more liquid, then just add a little more orange juice. For more healthy (& unhealthy-but ridiculously delicious) recipes from Jenny, go follow her lovely blog (or via bloglovin). You will also read about adventures with her pup Pip, a huge amount of AMAZING photography and a few youtube vlogs sprinkled around. I wish I could drink smoothies at the moment, I'm not allowed any fruit or vegetables and it's killing me! Yummy & vegan friendly! I love banana & avocado milkshakes too!